Josef Martinez scored an early goal but the lead didn't stand up for the defending MLS Cup champions. Roland Lamah scored in the 86th minute to give expansion FC Cincinnati its first point with a 1-1 draw. An announced crowd of 70,382 at Mercedes-Benz Stadium groaned loudly when the final whistle sounded, having witnessed another troubling outcome under first-year coach Frank de Boer. 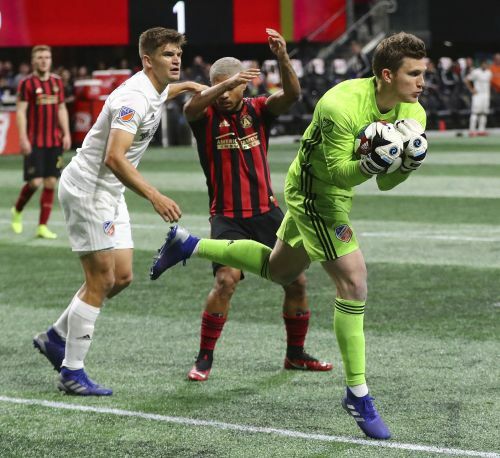 Atlanta opened the MLS season last weekend with a 2-0 loss at D.C. United and was coming off a 3-0 blowout by Monterrey in the quarterfinals of the CONCACAF Champions League. After hearing plenty of cheers during a pregame ceremony honoring the team's championship season, Atlanta got off to a rousing start. In the fifth minute, Julian Gressel sent a pass through two defenders to Martinez breaking into the clear. The reigning MLS MVP, who scored a record 31 league goals in 2018, sauntered in all alone on goalkeeper Spencer Richey, launching a shot over his left shoulder that put the home team ahead. FC Cincinnati, coming off an opening 4-1 loss at Seattle, was much more competitive against United. In fact, it looked as though it scored the tying goal in the 56th minute when Fanendo Adi headed one past keeper Brad Guzan. But the goal was nullified because Lamah was lingering offside away from the play. Lamah made up for his mistake in the closing minutes. Taking a long pass from Kenny Saief, Lamah raced into the area uncontested and blasted a low shot beneath Guzan's left leg to give Cincinnati a historic point. Both teams were coming off season-opening losses. NEW YORK (AP) — Bill Hamid had his 56th shutout in his 200th start for D.C. United in the Washington club's draw with New York City. New York City's Sean Johnson had his 54th MLS shutout. NYCFC (0-0-2) outshot United (1-1-0) 21-7, with six shots on goal to the visitors' three.